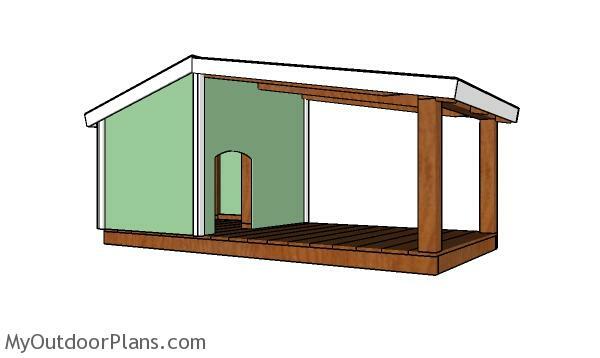 This step by step diy project is about free dog house plans with porch. I have designed this dog house with a front porch so you can shelter your large dog and offer it comfort. 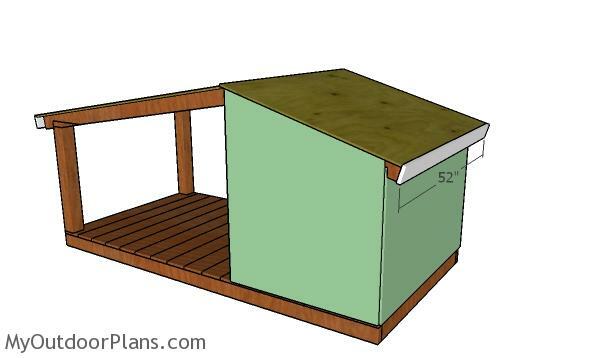 This dog house will create shade during the hot summer days for your pet. 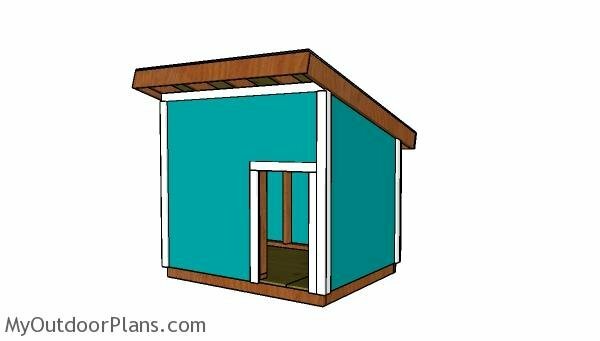 You can add insulation to the walls and roof of the dog house with minimal modifications. Take a look over the rest of my woodworking plans, if you want to get more building inspiration. It’s that simple to build a dog house! The first step of the project is to build the floor frame for the dog house. 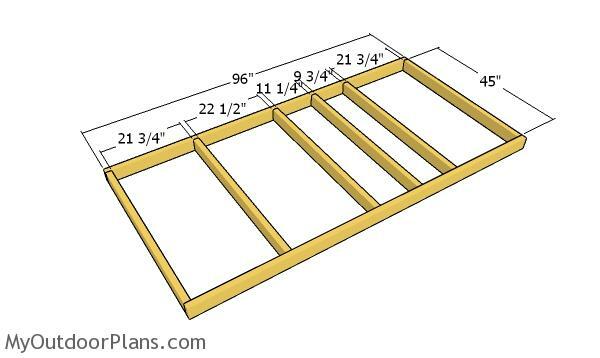 Use 2×4 lumber for the components and lay them on a level floor. Drill pilot holes through the rim joists and insert 3 1/2″ screws into the perpendicular components. Check if the corners are right angled and align the edges flush. The next step is to attach the 1×6 boards to the floor frame. Align the slats with attention and place a 3/16″ spacer between them to create even gaps. Drill pilot holes and insert 1 5/8″ screws to lock them into place tightly. Use 2×4 lumber for the wall frames. 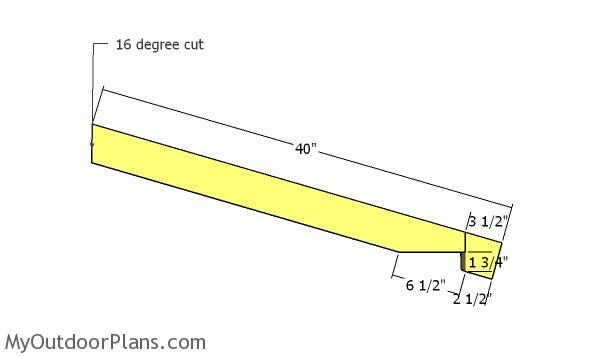 Cut all the components at the dimensions shown in the diagram. Drill pilot holes through the plates and insert 2 1/2″ screws into the studs. Place the studs equally spaced and make sure the corners are square. 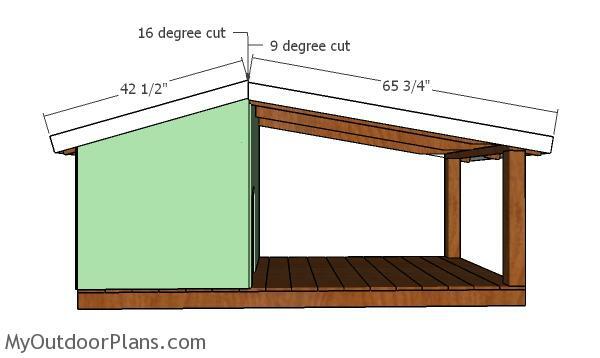 Build the back wall for the dog house, using the same techniques described above. Last, but not least, build the front wall. You can adjust the door opening to suit the size of the dog. 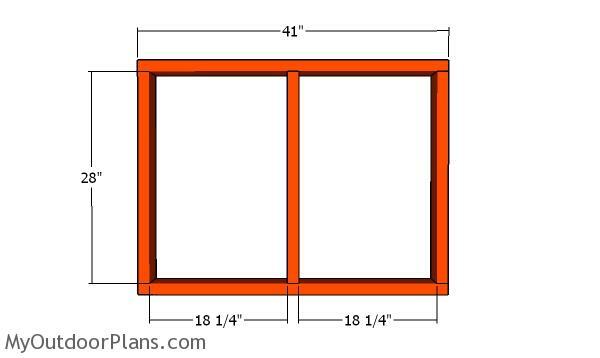 After building the 4 frames for the dog house, you have to fit them to the floor and secure them into place with 3 1/2″ screws. Align the edges and check if the corners are square. Insert the screws thorough the bottom plates into the floor and also secure the adjacent wall frames. 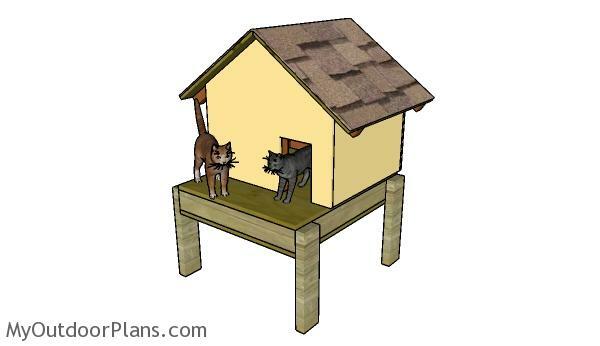 Continue the project by attaching the top ridge to the dog house, as shown in the plans. Drill pocket holes at both ends of the supports and insert 2 1/2″ screws at both ends. Make sure the corners are square and attach the ridge beam. 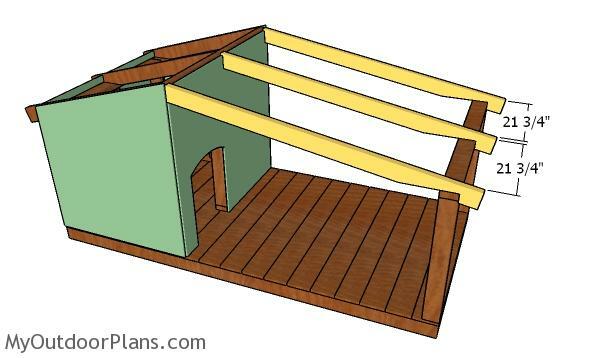 Use 2×4 lumber for the dog house rafters. 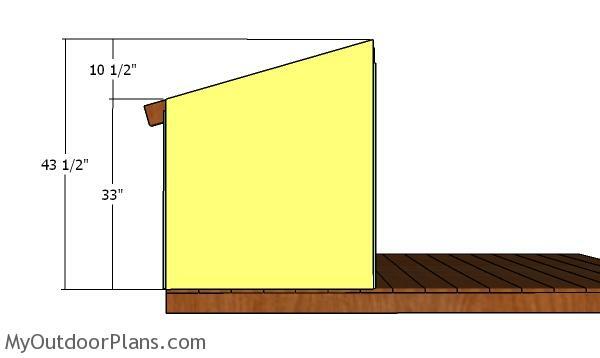 Use a circular saw to make the cuts to the rafters, as shown in the diagram. 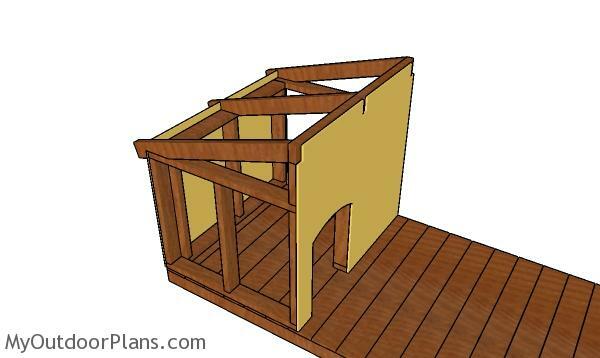 Fit the rafters to the top of the dog house, making sure you space them equally. Align the edges at both ends and then drill pilot holes. Insert 2 1/2″ screws to secure the rafters into place tightly. 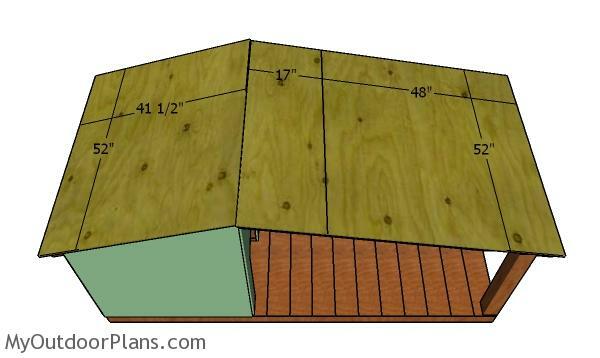 Use 1/2″ plywood for the exterior walls. Mark the cut lines on the panels and then get the job done with a circular saw. Fit the panels to the front and back of the dog house. Align the edges and insert 1 5/8″ screws to secure the panels into place tightly. Cut the panels for the sides of the dog house. 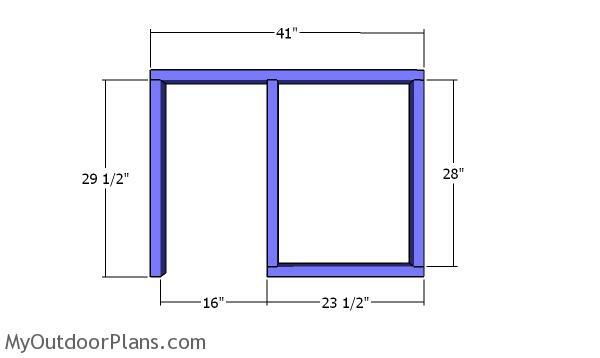 Attach the panels to the sides of the dog house and insert 1 5/8″ screws to lock them into place. 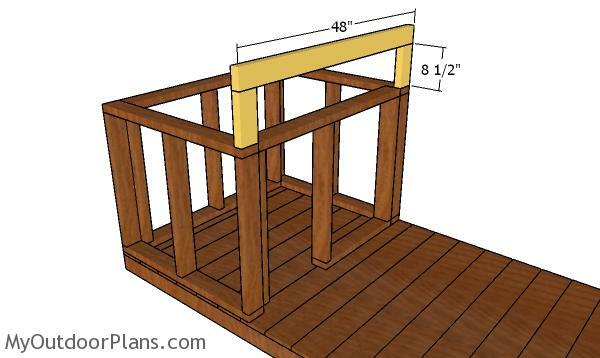 Use 4×4 lumber for the porch supports and 2×4 lumber for the top support. Drill pilot holes and assemble everything with 3 1/2″ screws. Make sure the corners are square and align the edges flush. 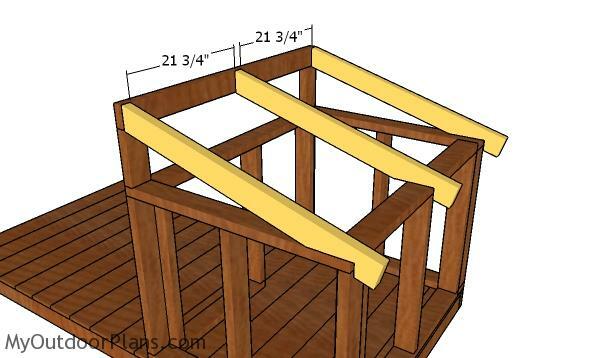 Use 2×4 lumber for the porch rafters. 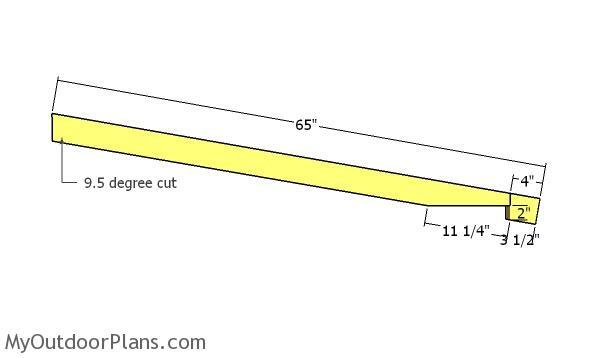 Make the cuts at both ends of the rafters, as shown in the diagram. 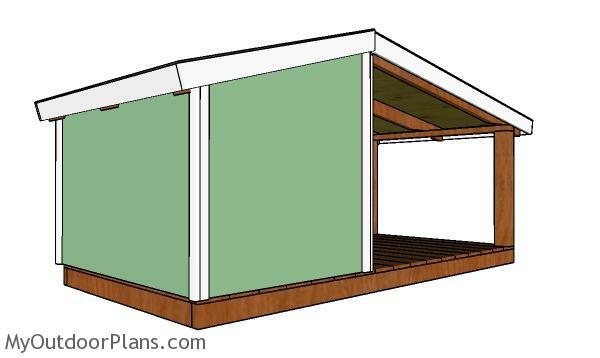 Fit the rafters to the dog house porch, as shown in the diagram. Drill pilot holes and insert 2 1/2″ screws to lock the rafters into place. 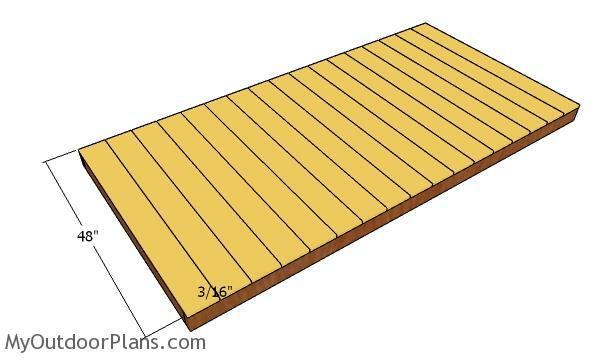 Use 1/2″ plywood for the roof sheets. 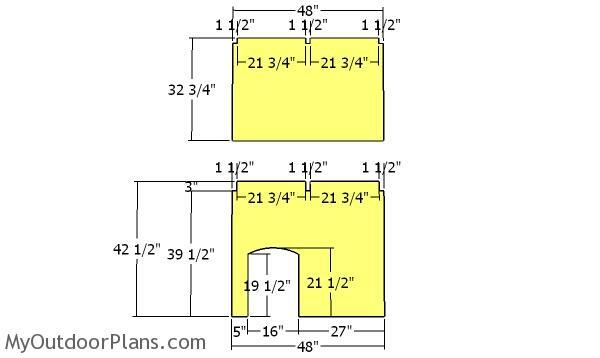 Cut the sheets at the dimensions shown in the cut list and attach them to the top of the dog house. Center the sheets to the roof of the dog house. 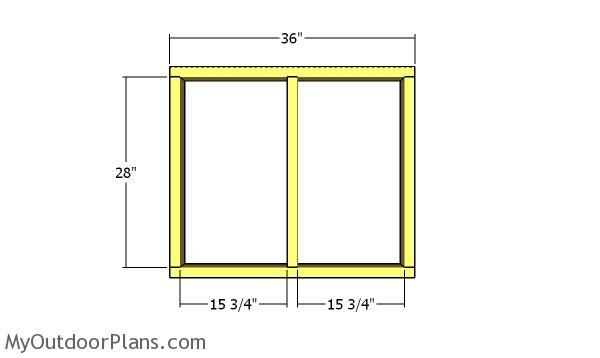 Insert 1 5/8″ screws to secure the sheets into place, every 8″ along the framing. Use 1×4 lumber for the front and back trims. Align the edges and insert 2″ nails to secure them into place. Use 1×4 lumber for the side trims. Make the angle cuts to the trims and then attach them into place with 2″ nails. Fit the tar paper to the roof. 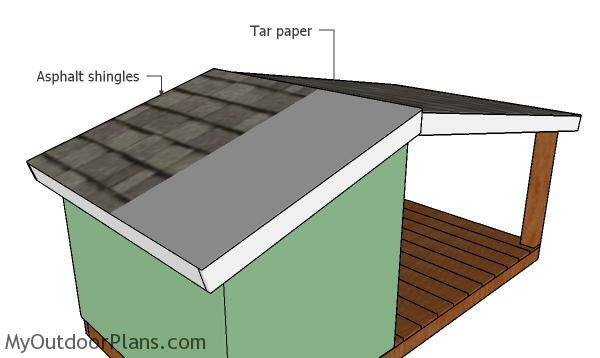 Attach the asphalt shingles to the roof. Read the manufacturer’s instructions to install the shingles properly. Apply a few coats of paint over the exterior of the dog house to enhance the look of the project and to . Fit 1×2 trims to the corners of the dog house. Align the edges and insert 2″ nails to lock them into place. This is a simple project you should be able to build in a few days without much effort. 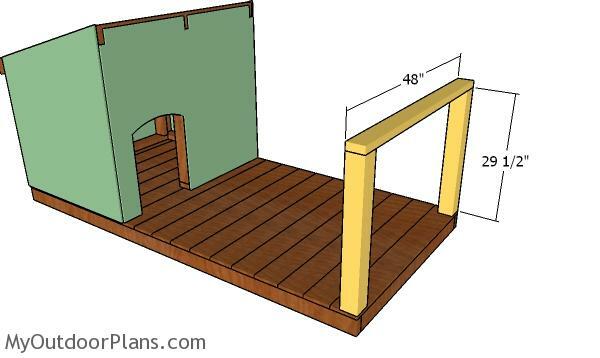 You can adjust the size of your dog house to suit your dog. 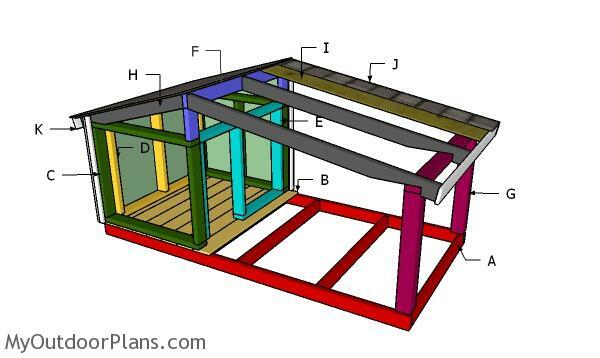 Make sure you take a look over the rest of my dog house plans. I have tons of designs you can choose from. 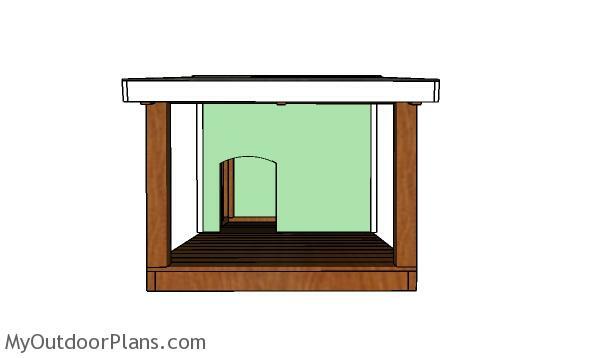 This woodworking project was about dog house plans with porch. If you want to see more outdoor plans, check out the rest of our step by step projects and follow the instructions to obtain a professional result.